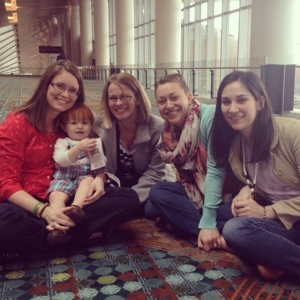 It has been a fun week of friends, fun and atleast a little bit of nerdy genetics this week in Nashville. The weather however has been horrible. 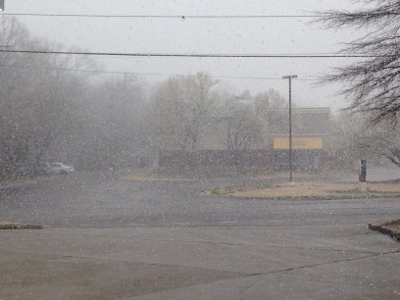 This is the site that welcomed me to town...snow pouring down...in late March. 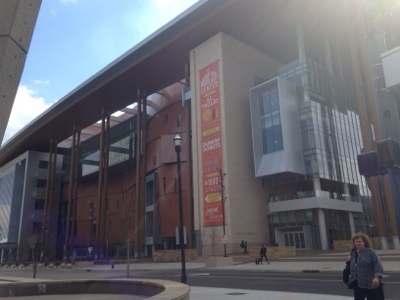 The conference was at the brand new Music City Center. It was so nice, and enormous. It took up 5 city blocks! We stayed just across the street at the Hilton Downtown. This was a good call since the weather was either snowing, raining or just plain cold. Ok, I have probably gotten my point across that we complained about the weather a lot this week. 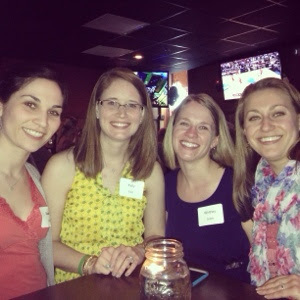 Theresa, Alexis, Whitney and I all bunked up together grad school style since only two of us had travel funding from work. 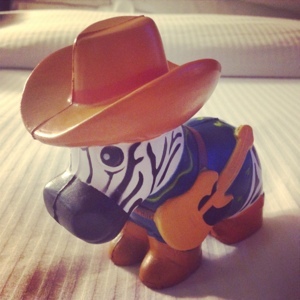 You can't attend a genetics conference and not come home with a new GeneDx zebra for your collection. We were super excited about these country star zebras. So cute! We also drank a lot of coffee. 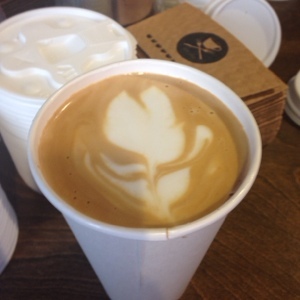 This was my favorite cup, from this little place called Coffee, Lunch Nashville. So pretty. 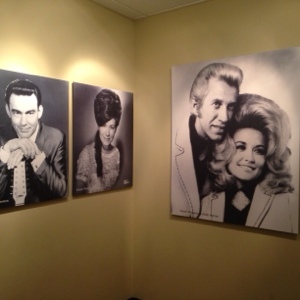 We got to do a little sightseeing one afternoon and took a toured the Country Music Hall of Fame and RCA's Studio B (where Elvis and Dolly Parton recorded). As close as we live to Nashville we really don't get up here very often, and definitely don't often do touristy things. 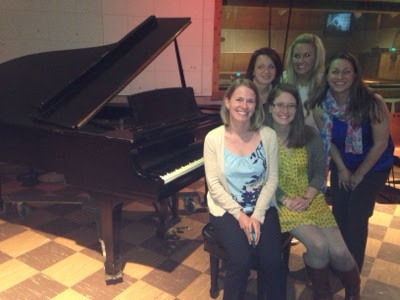 So cool to think about everything that has gone down in this room, and at this piano. We got courted by genetic testing companies with happy hours and all manner of swag. BTW, the newest and best swag on the market? A portable USB charger to charge phones and electronics on the go. 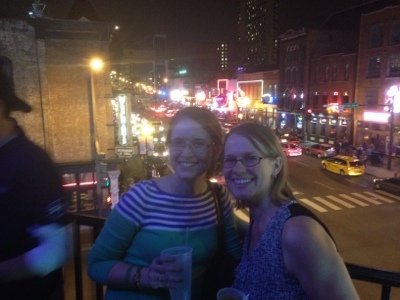 The events were especially fun in Nashville where there are so many cool venues and entertainment options. At one event we even got free CDs for the up and coming music artist that was playing. 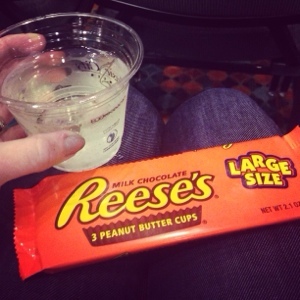 Another highlight of every ACMG is the refreshments and diagnostic dilemma session. Essentially a bunch of genetics experts sit in a room and discuss difficult cases and ask for help and opinions. Although we don't have tons to offer from a diagnostic perspective in a room full of genetics MDs...it is quite fun and informative to just be a fly on the wall. Downtown Nashville and Broadway is quite the lively place. On multiple occasions we felt and acted like old people complaining about the loud music and shenanigans happening on the streets below our hotel room. Can you believe people were still playing music and running around at 11 pm on a wednesday night?!? It was pretty neat to see and experience it all though (and then go back and crawl into bed at a reasonable hour). But the best part of the week was when this little guy and his dad drove up to meet me. 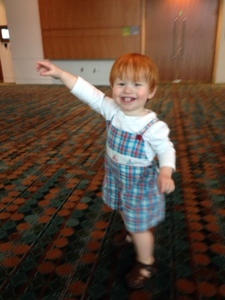 Perry loved running up and down the massive hallways of Music City Center and waving at all the passing geneticists and genetic counselors. And he finally got to meet a few more of my classmates. He loved the attention from so many girls! The conference officially ended yesterday so Andrew, Perry and I went and checked into Opryland, our home for our final night in Nashville. We spent the evening wandering the hotel and doing some shopping at Opry Mills because you guessed it...it was still cold. And raining. Today we are going to explore a little more before heading home.